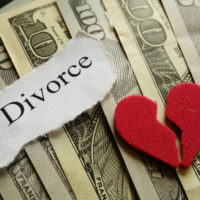 Going through a divorce requires couples to grapple with their finances. This includes calculating not only assets and income, but also expenses and liabilities, which can be a complicated process, especially for those without assistance from an attorney or a team of financial experts. These calculations play a critical role when it comes to dividing up marital property and debts, so if you and your spouse are considering divorce, you should reach out to a property division attorney who can represent your interests, whether during negotiations or in the courtroom. Couples who are able to agree to the terms of a divorce and then present their mutual agreement in writing to the court, can usually have their marriages dissolved much faster, as their divorce is technically uncontested. Contested divorces, on the other hand, require a court to step in and divide a couple’s assets on an equitable basis. While this can take the form of a 50/50 split, this result is by no means a guarantee, as courts are only required to create an arrangement that they deem to be most fair to both parties. It’s important to note that this equitable distribution doctrine only applies to marital property, or assets that were acquired by either spouse during the course of the marriage. The only exceptions to this rule apply in cases where one spouse receives an inheritance or a gift while married. All other property obtained by either spouse before the marriage actually took place is known as separate property and will remain in the hands of the original owner, unless the assets were so commingled during the marriage that they essentially became marital property. When it comes to proving whether an asset is marital or separate, having clear and extensive financial documentation is key. Similarly, divorcing couples should obtain copies of all documentation related to their debts and liabilities, as these obligations are also distributed between spouses in an equitable manner. For instance, courts are often willing to assess the spending habits and incomes of each spouse, as well as a couple’s expenses and costs when determining who will retain responsibility for paying off marital debt. If, for example, one spouse clearly acted recklessly in incurring a debt without the other spouse’s knowledge, or acted in such a way that seriously inhibited the couple’s ability to pay off the debt, that individual could be held responsible for paying off the entire amount. Records of these costs, which could include bills, receipts, invoices, bank statements, and loan documents are critical to ensuring that all property settlement agreements are fair to both parties. Distributing marital property and coming up with an alimony or child support arrangement during divorce requires the collection and assessment of all of a couple’s bills and financial records. For help collecting this evidence and ensuring that your own divorce settlement is fair, please contact dedicated property division attorney Sandra Bonfiglio, P.A. at 954-945-7591 today.